Monday October 18th 1926 I got out the basket and began work on the rug I left when I went to Oklahoma City. Was busy with that all day. Had a letter from Alice Condon asking me to stop at Carthage. Tuesday October 19th 1926 I worked all day on the rug. It was dark and cloudy with some rain. I had letter from Hattie. In the evening I wrote to her and Alice Condon. Both girls home from school early. Wednesday October 20th 1926 I worked on the rug and finished it before four oclock. Cleaned out the basket and put every thing away. Letters from Joe Woolf and Mrs Pickens. She told of Florida conditions after the storm. Wrote Winnie and Cousin Jen. 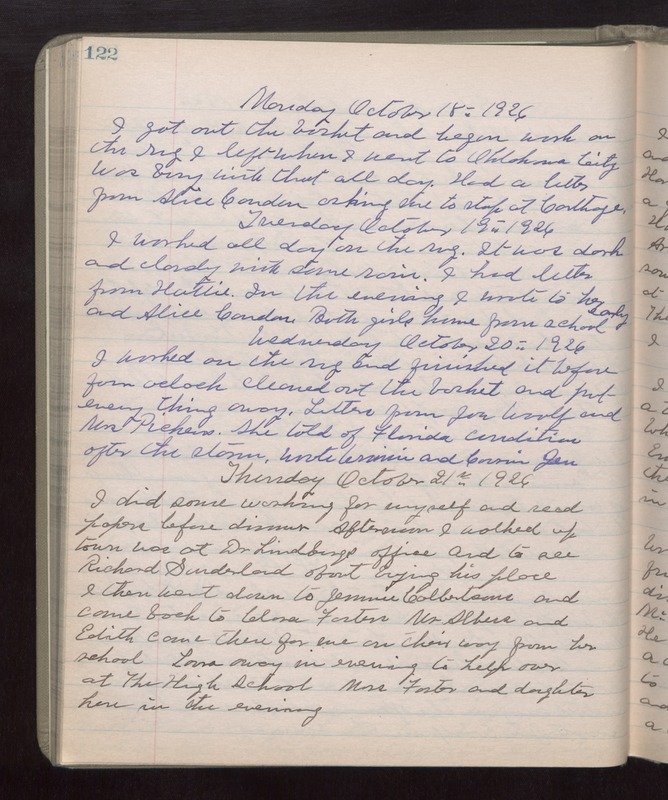 Thursday October 21st 1926 I did some washing for myself and read papers before dinner. Afternoon I walked up town was at Dr Lindburgs office and to see Richard Sunderland about buying his place. I then went down to Jennie Culbertsons and came back to Clara Fosters. Mr Albers and Edith came there for me on their way from her school. Laura away in evening to help over at The High School. Mrs Foster and daughter here in the evening.